Use as an eraser or as a blender between two or more colors. The "blurring" pen does not add colour but acts as a blender, softening marker lines on your plastic kits (and blending two colours if you've applied two). 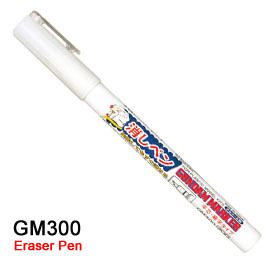 The eraser pen cleans up paint run off quickly just like a rubber eraser. By rubbing over the area run off, excess paint is dissolved and cleared.